On Monday, 4 February around 2pm, a man believed to be in his late 50s was hit by a bus on the M1 Higginson Highway near the Havenside offramp. The victim was in critical condition when paramedics arrived on scene. Rescue Care Paramedics arrived on the scene to find the critically injured man on the busy highway. Rescue Care Paramedics Garrith Jamieson said, “The victim sustained multiple injuries and Advanced Life Support intervention was needed, including placing the man on a manual ventilator. 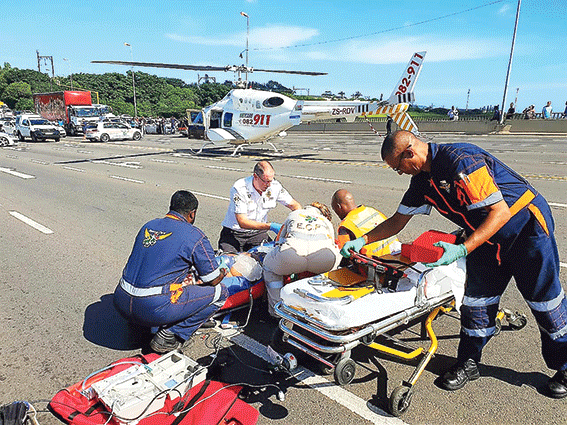 Due to the seriousness of the man’s injuries the NetCare911 Medical helicopter was called in to rapidly transport the injured man to a Durban hospital for the further care that he required.